The CR1000KD is a portable keyboard and display screen for our CR1000, CR800, and CR6 dataloggers. It allows you to check the datalogger's status, display or plot sensor readings and stored values, and enter numeric data or change port/flag state. One CR1000KD may be carried from station to station in a datalogger network. The CR1000KD displays 8 lines x 21 characters (64 x 128 pixels) and has a 16-character keyboard. The CR1000KD is powered by the datalogger’s power supply. An SC12 connects the CR1000KD to the CR1000WP or CR800; the two connectors on the SC12 allow attachment of additional peripherals. There is not a CR1000KD Operator's Manual. 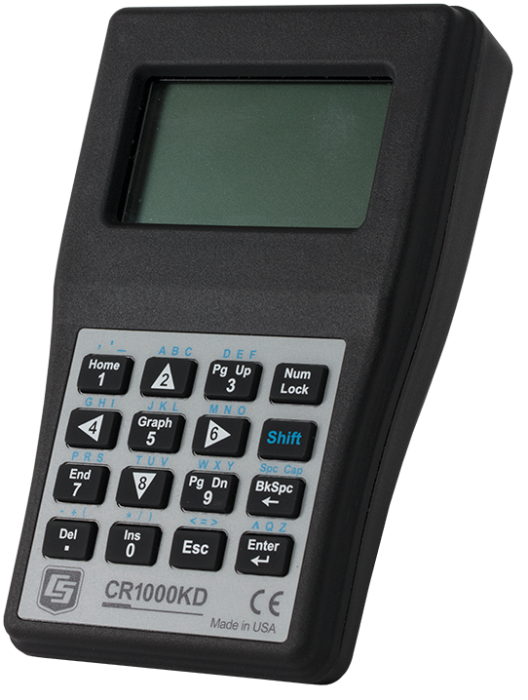 Operation of the CR1000KD is described in the CR800 and CR1000 datalogger manual. CR300 The CR300-series dataloggers do not have the necessary CS I/O port required by the CR1000KD for connection to the data logger. CR310 The CR300-series dataloggers do not have the necessary CS I/O port required by the CR1000KD for connection to the data logger. Can the constants located within the ConstTable/EndConstTable instructions be edited? Yes. After a ConstTable is declared in a program, it can be accessed using the CR850 or CR1000KD keypad display and the standard/default data logger menu. It appears under Configure | Settings. Is it possible to use the CR1000KD to connect to remote RF stations using an RF modem and a radio? No. The CR1000KD is designed specifically for use on the CS I/O port of the CR800, CR1000, and CR6 dataloggers. Are custom menus displayed on the terminal interface? CustomMenu instructions apply to the CR1000KD, CR850, and CR3000 display. Custom menus are not displayed or passed through to the terminal interface. Is there a way to allow a user to change constants in a CR800, CR1000, CR3000, or CR6 program without allowing the user to make other program changes? In OS 24 (CR6 OS 01) and later, a user can change constants from the CR1000KD or a terminal emulator without touching the program. The program must contain a ConstTable/EndConstTable construction for this to occur. Because the program does recompile, collect the data first. Are the CR800 and CR1000 capable of being programmed through a CD100 or CR1000KD without the use of computer software? Although it is recommended to use software such as Short Cut for programming, the CR800-series, CR1000, and CR3000 dataloggers can be programmed with the CD100, CR1000KD, or integrated keypads. The keypad can be used to create new programs or edit programs that already exist in the data logger memory. Select File and press Enter. Select either New or Edit. To modify an existing instruction, select the instruction, and press Enter. To add a new instruction, press Ins, and select Instruction.